Catapulted into a midlife crisis she wishes she’d had earlier, she decides to turn her life upside down, quitting her job and instead beginning to chase her long-held dreams of becoming an actress! Emily Forsyth seemed to have it all. A great job working for an airline, all the accoutrements a single woman needs along with a pilot boyfriend named Nigel who she hoped to soon marry. When Nigel announces that he’s leaving for a younger woman, she takes it badly. After being talked down by her friends, she decides that this is the perfect time to follow her dream of becoming an actress, before it is too late. Many already thought it was too late, at 40 years of age. Emily knows she will have to sacrifice, she lived in someone else’s home, rides a bike everywhere and has to take a series of low paying jobs while waiting and working towards her big break. Was Emily right to quit her job and pursue her dream? The Start of Something Wonderful is pure chick-lit. It is a story of second chances, following your dreams, standing on your own two feet and becoming a person you love and respect. Emily is a strong character, stronger than she herself realized. I could never have started my life over at the age of 40. The plot is filled with a lot of amusing scenes, as well as heartwarming and uplifting ones. It was a very realistic sounding story of what Emily would have gone through while embarking on this new life. Having the author narrate her own book is a plus. She knows exactly where to add the emphasis and drama in the story. The emotions she is feeling come through in the voice.There are also sound effects in this story which reminded of the radio shows that my parents talked about. My one issue with this book is length. It was long and there were several sections that I wanted to skim (hard to do in an audiobook) due to some extraneous information that I felt could have been cut and would not have damaged the story. Overall, this was a good second chance, follow your dreams story and if you take nothing else from this book, remember it is never too late to start over. Jane taught English in Vienna then travelled the world as cabin crew, before making the life-changing decision to become an actor and voice-over artist in her mid-thirties. She has appeared in “Calendar Girls”, “The Curious Incident of the Dog in the Night-time”, “Deathtrap”, and most recently “True West” in London’s West End. She has recorded audiobooks for BBC AudioGo, Isis Publishing and HarperCollins. 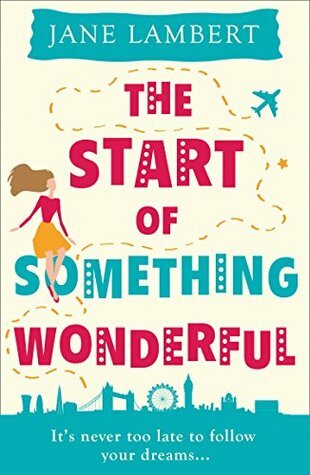 She is currently adapting “The Start of Something Wonderful” into a 6-part comedy drama for TV. I know, I can’t imagine that at all, By the time I was 40, I had two kids, a husband, a house, a job ….. I would not want to go through that all over again. More power to Emily and those that follow that call to make a huge change.